One morning as you stare back at that familiar face in the mirror you notice a change. Maybe it’s a dry patch of skin or a breakout on your chin. You take extra care to follow all the steps in your skin regimen, but it’s still there … What’s going on? Your skin is the largest organ in your body and a key to what is going on inside your body if you know how to read it. You wear what you eat on your face. The most common cause of acne is hormonal changes. What if I told you there was a map to pinpoint the source of the problem? 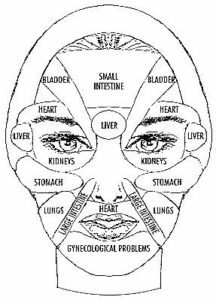 Deidre Moore Belfiore, Partner at GetWellness Center, uses the ancient method of Chinese mapping to locate the meridian (area) of the face where your acne is occurring. As you can see from the picture below, she then uses this to determine what’s going on inside her patient. There was a client that walked into our center with acne on her forehead Deidre recounted. Immediately I asked her what was going on with her kidneys and a few days later she started peeing blood. Blood in your urine is an extreme example but a vivid one to alert you to pay attention to those bumps. As we age, it’s common to find patches of skin that are darker than the surrounding skin. This condition can affect any skin type. These spots are often attributed to overexposure to the sun. What if you dig a little deeper and take a look at what foods you are consuming? “Dark spots are directly related to meat and dairy. They are coming from the gut, and the lymphatic system is unable to drain. You can’t clean your skin without cleaning your colon….It all begins from within.” says Deidre. Try a plant-based diet abundant with fruits and vegetables for a healthy body (skin included). One quick hack to get started is to start your day with a green smoothie like this one from Prevention Magazine. Psoriasis is a skin condition that causes red, scaly skin that may feel painful, swollen or hot. Dermatitis is a condition that causes the skin to become itchy and is the most common form of eczema. Water filtration is a crucial component to the success of GetWellness Centers’ clients. They have partnered with Aquasana to provide whole house water filtration systems. Our bodies interact with water in more ways than the water we drink. Think about the water used to wash your clothes, your dishes and the water we use to bathe to name a few. It’s a commonly held belief that as we age, wrinkles are part of the package. Have you ever wondered why some people seem to age better than others? “As far as wrinkles it’s just directly related to lack of hydration and lack of nutrition. Taking in the right amount of supplementation that your body needs. …You’ve got to give that skin hydration. Dr. Murad’s team taught me that fruit and vegetables go through the cell wall. That changes everything. Those cells are plumped up.” comments Deidre. Compared to wrinkles and acne, cancer is when your skin is shooting off the big cannons. Skin cancer is the most common form of cancer, and there are various types. “It’s the body responding to the sun that’s causing cancer. The sun has nothing to do with it,” commented Michael Potter, Deidre’s Partner at GetWellness Center. Let’s break that thought-provoking quote down to what’s going on inside our bodies. It’s often said that a clean diet may reduce the risk of cancer. A 2017 analysis, confirmed that a vegetarian diet reduced cancer risk by 8% and a vegan diet decreased risk by 15%. You don’t have to decipher these warning signs alone. The mission of the GetWellness Center is to help you along your journey to sustainable health and wellness. Call us today at 916-721-6566 to get started.